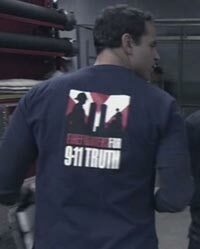 Firefighters for 9/11 Truth on FX Series "Rescue Me"
Franco Rivera, the character portrayed by Daniel Sunjata on the FX series “Rescue Me” can be seen wearing a Firefighters for 9/11 Truth t-shirt in the first episode of the show’s new season. Sunjata’s character first revealed his views about 9/11 to a journalist on a 2009 episode of the show. Sunjata is also a 9/11 activist in his personal life and provided the narration for the film Loose Change 9/11: An American Coup.